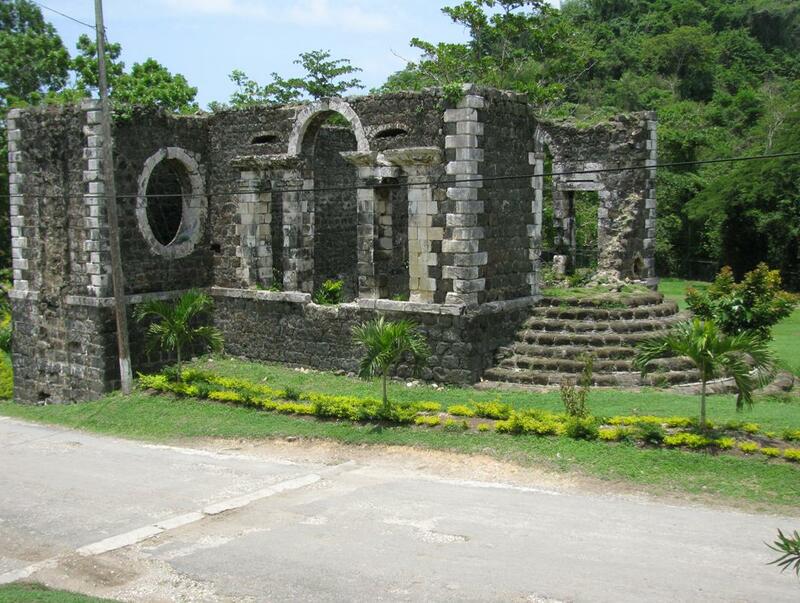 The Kenilworth ruins in Hanover are amongst the most impressive of 18th Century industrial buildings in Jamaica. They compare with the Orange Valley and Good Hope Estates in Trelawny. Kenilworth does not appear on the eighteenth century maps of Jamaica, as the property was originally known as Maggotty, likely named after the Maggotty River which runs through the property. The Estate is first mentioned in the Crop Accounts in 1757 as Maggotty and Top River Estates. It was then owned by John Blagrove, a minor; and produced 132 hogsheads of sugar, 43 puncheons of rum and 50 casks of molasses. The overseer at the time was Lachlan Shaw. By 1761, the Estate was listed as Maggotty (without the Top River). It then produced 159 hogsheads of sugar, 36 puncheons of rum and 53 casks of molasses. The Crop Accounts of 1810, records John Blagrove (no longer a minor) as the owner of the estate and the production of sugar had increased to 231 hogsheads. By 1819, production on the estate had fallen drastically. Production for the year ending December 31, 1819, was 89 hogsheads of sugar and 75 puncheons of rum. The overseer at the time was John Kindley. In 1833, Maggotty Estate was owned by the heirs of John Blagrove and was under the management of James Deanery, attorney. By 1833, production had decreased to 60 hogsheads, 15 tierces and 25 barrels of sugar, and two puncheons and four hogsheads of rum. The overseer was Peter Campbell. The property eventually became known as Kenilworth; there is no record to explain the reason for the name change. The Return of Properties, 1882 record Kenilworth as comprising 2,560 acres, with 500 acres in common pasture and pimento and 2,060 acres in wood and ruinate. The owners of the property were listed as the heirs of William Browne. By 1920, the property had increased to 2,963 acres; by then it was rented to tenants and used to cultivate coconuts. The registered owner of Kenilworth in 1938 was Ethel Browne; at that time, the property was put to banana and coconut cultivation. Beyond the works ruins can be seen a small burial ground with a brick wall and a slab in memory of Thomas Blagrove Esq., Representative for the Parish of Hanover who died on the 8th July 1755 in the 22nd year of his life leaving a widow and one son. Frank Cundall (1905) in referring to Thomas Blagrove mentions that he was buried at Maggotty. It is likely that Thomas Blagrove was the father of the John Blagrove (a minor) listed as owner of the Maggotty Estate in the Crop Accounts of 1757. These structures, though in ruin, illustrate the high level of architectural design and construction during the time when sugar was ‘king’. The mill-house, constructed of stone with its semi-circular entrance stairway, is a striking structure. It consists of two floors with a large space on each floor and a narrow space between two walls which could possibly have accommodated a water wheel. An unusual feature of this building is the elliptical window openings. It is believed that there was a tunnel which led from this structure to the stream. The other structures comprise a separate unit. They are identical structures parallel to each other and was probably the boiling house and related parts of the sugar processing complex. They are constructed of stone, which was most likely taken from the nearby Maggotty River. Executed in the same architectural style – lime/coral stone has been used for the quoins and other detailing with the main wall in darker stone laid in rectangular courses. Cundall, F. (1915). Historic Jamaica. (London: West India Committee). Senior, O. (2003). Encyclopedia of Jamaican Heritage. (Red Hills, St. Andrew: Twin Guinep Publishers Ltd).